Whether it’s in your own pool, your neighbors pool, the local aquatic centre, or the beach – there is nothing like a refreshing dip on a hot day. It’s one of my favorite memories from my childhood, swimming all day, every school holidays, with all the neighborhood kids, in my grandparents pool. They even had diving towers for endless amounts of fun! There were not many rules but one of them was that we always had to be sun smart. We know how unforgiving the harsh elements can be so when it comes to being sun smart a sun protection shirt is an absolute must. They provide great sun protection for your torso and arms whilst out swimming in the sun. This article will explore the best UV swim shirts for your whole family. You may be asking yourself why do you need a swim shirt if you are wearing sunscreen? Well for multiple reasons actually. Sunscreen generally needs to be reapplied every 2 hours or after swimming, time often gets away from us if we are swimming with kids, or sitting at a swim up bar. 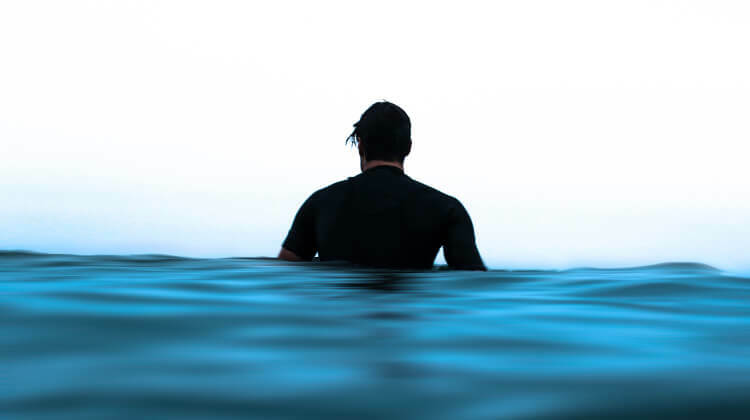 You might also be out catching a few waves and don’t really want to come back in to reapply your sun protection. I know that sun shirts can also can have a bit of an ‘uncool’ stigma about them, or you might want to show off your summer body that you have been working on. The good news is that I will give you some stylish options to choose from. There is nothing worse than working on your summer body all winter only for it to get sunburnt in the first week of summer, save it for when you are lounging around in the shade. For those of you that are worried about your tan the Skin Cancer Foundation provides some important information on the risks of tanning, my advice, fake (tan) it until you make it. 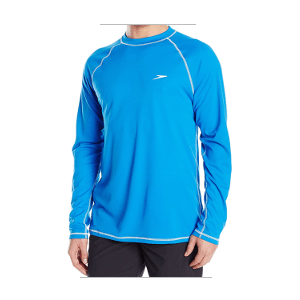 After thorough research into requirements for the best sun protection swim shirts SimplySunSafe recommends Speedo Men’s Easy Long Sleeve Rashguard Swim Tee as the best swim shirt for. Read on for a detailed buyer’s guide, comparison table, and in-depth reviews of the top 5 swim shirts for this summer! UPF is short for Ultraviolet Protection Factor this little number provides you with important information on how much of the sun’s harmful ultraviolet rays may penetrate your clothing and potentially harm your skin. Clothing that is pulled too tight could become thin and transparent, resulting in less effective protection. Old clothing that has worn will also lose its ability to protect you from those rays, if it’s feeling old toss it out and get a new one. See what dermatologist Dr. Levin thinks about UPF rated clothing here. You and I both know there is nothing worse than being in wet clothing. It’s sticky, uncomfortable and hard to get off. For me I also get cold! Even in the boiling heat. I HAVE to get out of it if it’s not quick drying. Also, as I mentioned earlier the UPF rating of fabric may be affected when it becomes wet. If you know you are going to be in and out of the pool or beach for hours this will definitely be something for you to consider. You and I both know that not everyone is built the same. Some of us want a tight fitting swim shirt that still shows off your toned body while others want something a bit loser so they can eat those extra tacos and not have to worry about tearing the seams (I fall into this category). The good news is that there are options for both of those body types! There is also other things to take into consideration like if you want long arm length, short arm length, no arm protection, higher neck protection, collars, and zip-up options. We can all be budget conscious at times so this is an important one. Luckily for us there are lots of fashionable and cost-effective options for us that still provide great sun protection. If there is a higher priced item that you would like compare the cost of applying sunscreen on your body every time you head out into the sun versus one item of clothing. After careful research that combined discussing issues with customers, reviewing customer feedback, examining manufacturer specifications, participating in safe sun practices forums, SimplySunSafe has chosen the 5 best sun safe swim shirts. These rashguards provide a great UPF rating, are reasonably priced and quick drying, and comes in a number of styles to suit the whole family’s needs. Speedo! Most of us know this iconic brand, even if it’s just the logo you see you may know exactly who makes this one. They are one of the most well known swimwear brands of our time, sponsoring some of the most successful olympic swimmers. 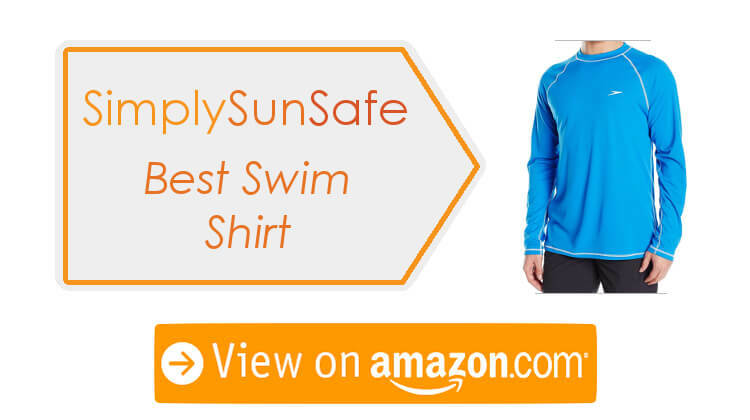 This swim shirt has come out as our winner so let’s look at why SimplySunSafe chose this as our top recommendation. This long sleeved option provides your entire torso and arms with great coverage. It is rated at UPF 50 for excellent protection. This polyester, quick-drying option makes it even better as there is no need to try and pull a wet swim shirt off you, you can just go straight to lounging around in the shade. Another reason why this one came out on top was the fit. It’s a loose-fitting option which means it is even more comfortable. Available in 5 sizes, S to XXL, and 9 colors there are plenty of options to choose from. This one is a little on the higher price side but the quality of this piece is well worth it. I also think that while yes, this is the best sun protection swim shirt for men its loose fit means that women can also wear this one too! Get Speedo Easy Long Sleeve Swim Tee Now! This Kanu surf shirt is another great option for men. Like the winner, it’s rated UPF 50 for great sun protection. This swim tee is a short sleeved option so you will still need to make sure you remember to apply and reapply sunscreen to your arms. It’s super comfortable and light as it’s made from a Polyester blend, and is a loose fit so will look great on everyone. For sizing there are 5 options ranging from S up to XXL. It’s available in a massive 13 different colors and for something a little different the side panels are contrast color. This fabric is also ideal for swimming, running AND working out as this guy also wicks away moisture. Now let’s look at budget, this one comes in nice and reasonable. So reasonable that you could possibly buy two! This one came in at a very close second, only because it has short sleeves did it not take out the top place. Get Kanu Surf CB Swim Shirt Now! This Baleaf rashguard is the best sun protection swim shirt for women! I loved this one as it has so many great little features. I am a sucker for those added extras and this one helps me sort out a dilemma I always seem to have, but that is getting ahead of myself. So we start with a UPF 50 rated long sleeve rashguard. The Nylon and Spandex blend make it comfortable, breathable, moisture wicking and quick drying, making it a great water to relaxing option. Now here is where this one gets me. It has a back pocket to put your ID, cards, keys and anything that’s pocket size. There is nothing that annoys me more than having to take a whole heap of stuff to just have a swim and then needing to leave it wrapped up in a towel and hope that no one runs off with it. This one solves my dilemma! The next thing I love about this one is that it has board short connectors to secure your shirt to your boardies if you’re wearing them. Sometimes you jump in the water and then the next thing is your swim shirt is up over your stomach, no need to worry about that with this one, you can connect it to your shorts and then you know you are always protected from the sun. Sizes go from XS to XL and reviews state it fits as expected most of the time. There are however only 3 color options so that could be an issue if you are after something specific. This one is also on budget so I am a happy camper all round! Here we have a ladies version of the Kanu rash guard. This one is rated a nice and high UPF 50 so you are well protected from the sun. It’s got long sleeves giving your torso and arms maximum coverage so those harmful rays don’t stand a chance. It’s fabric is a Polyester and Spandex blend which is quick drying and a slimmer fit but reviews do state it’s not super tight. Great for catching a few waves! Now for the nitty gritty, you have 5 size choices, XS to XL and a choice of 10 bold and bright colors. This rashguard is great for the pool/surf and as a lounging around option. It has stitch detailing on the front for something a little extra and the Kanu logo on the front. This Kanu option is also inexpensive for all of us budget-friendly fashionistas out there. Get Kanu Surf Keri Long-Sleeve Rashguard Now! These boy and girl versions are my pick for the best sun protection swim shirt for kids. They have the same great features as mom and dad versions. Now you can even match your kids! A high protection rating of UPF 50 means you can be sure your kids are covered, no more chasing them around trying to rub sunscreen over them, and don’t even try to get them out of the pool to reapply! The fabric blend of polyester and spandex means it’s quick drying and comfortable. Long sleeves means your little ones have their torso and arms completely covered. The girl version comes in toddler and big girls sizes and the boys has toddler, little boy and big boy size options. Your size selection will determine your color range but there are a total of 12 options for the girls and 10 for the boys. Budget friendly, an easy choice if you are already getting one of these for yourself, and they also have swimsuits to match. Reviews do state that this product color may run when washed so ensure you wash these separately. 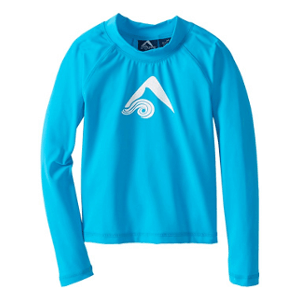 Get Kanu Surf Kids Rashguard Now! This article was written for those of us looking for a new swim shirt. I hope it has provided some useful information about what you should look for when you begin your search. 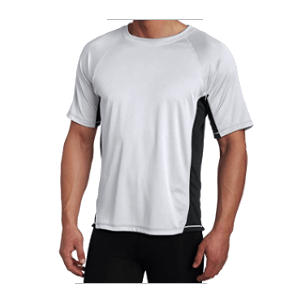 SimplySunSafe recommends the Speedo Men’s Easy Long Sleeve Rashguard Swim Tee as the swim shirt you should definitely consider purchasing. After looking at all of the features that make sim shirt great, this was the product that came out on top. If one of the other four better suits your needs, go ahead and choose that one because ultimately the decision is about your skin and needs. Remember a swim shirt is not your only defence against the sun harsh rays. To refresh your memory on skin cancer prevention guidelines see the American Academy of Dermatology’s tips on protecting yourself when outdoors. I love hearing from you guys, so if you purchase any of these, or find another option you think is better please let me know about it in the comments. I’ll do some research and add this to the guide. I hope you enjoyed my article on the best sun protection swim shirts I hope it has helped you make better choices about your sun protection.